YOU WILL RECEIVE PERIODIC UPDATES FROM COLOROFCHANGE.ORG AND COLOROFCHANGEPAC.ORG. YOU MAY UNSUBSCRIBE AT ANY TIME. Voter fraud is a myth that is perpetuated to keep Republicans in power and Black people away from the polls. Earlier this month Secretary of State Lawson ordered a raid on the largest voter registration drive in Indiana. 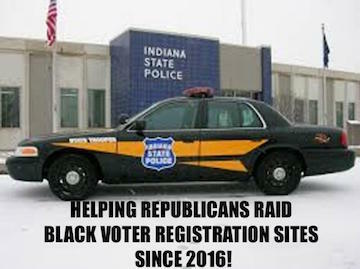 45,000 Black voters may lose their stake in this upcoming election because Indiana Secretary of State Connie Lawson has turned their registration forms over to Indiana State Police based on vague allegations of voter fraud. Sending police to the homes of Black voter registration workers and to raid entire community registration drives is clearly a ploy to intimidate an entire community of voters. The police raid happened in predominantly Black Marion County and the investigation has expanded to 56 other counties, including Lake County. Sixty-percent of all Black people live in either Marion County or Lake County, in a state where less than ten percent of its population is Black. No one should lose their right to vote because of human error. Two years ago Lawson herself said that 1 in 8 files on the statewide voter file had inaccuracies. We are urging Secretary of State Connie Lawson to fulfill her duty as the top Elections Official of the State of Indiana and do not allow unfounded claims of voter fraud deny the right to vote to 45,000 Americans. The right to vote is the most fundamental right in our democracy. You have publically said that as head of elections for the State of Indiana your greatest concern is that people have confidence in the system. We know that our electoral system is not perfect, but it will never get better as long as elected officials like yourself continue to make unsubstantiated claims of voter fraud. Spurious claims of voter fraud does not bring accountability. Instead, it criminalizes and intimidates the very voters it is intended to protect. You can restore everyone’s confidence in the system, by allowing the people whose registration status is being compromised by the investigation cast their ballot on November 8th. The voters whose registration have now come under the scrutiny of state police should not be held in limbo because of an investigation. In the 21st century, where states are passing legislation to make the voter registration easier and more accessible, absolutely no one should lose their freedom to vote over simple mistakes. Secretary of State Lawson, you have an opportunity to choose to be on the right side of history. We hope you choose democracy. Paid for by ColorOfChange PAC, colorofchangepac.org, not authorized by any candidate or candidate’s committee.